Hearing is one of the most empowering of our senses; it enables us to work, socialise and communicate. It's hard to imagine living in a silent world, yet just 60 years ago this was the inevitable outcome for the majority of people with ear disease or language problems. Nowadays, virtually everybody can be helped to some extent and many cured. 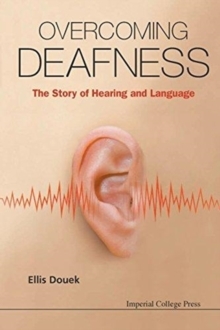 But how did we get here?This book tells the fascinating story of science and medicine's winning battle with deafness, covering all the hearing diseases and the progress of their treatment from the beginning of Ellis Douek's career in the 1950s to the present day. Unlike other books on hearing, this covers language disorders as well as the surgery of deafness; it is a book about human communication, discussing music and poetry as well as delving into the medical science.In our ageing population, hearing disorders are increasingly a part of everyday life; that they are almost always treatable should not be taken for granted. This book should be the first reference for anyone who has experienced hearing loss and would like to know more about hearing and language development, and for professionals in hearing science, medicine and allied fields of interest.